A desperate princess, a magical traveler, and a watch that binds them together with the fate of a dying world. Vi Solaris is the heir to an Empire she’s barely seen. Her parents sacrificed a life with her to quell a rebellion and secure peace with a political alliance. Now, three years past when her wardship should’ve ended, Vi will do anything to be reunited with her family. The Empire is faltering beneath the burden of political infighting and a deadly plague. Yet, Vi can’t help but wonder if her inability to control her magic is the true reason her parents haven’t brought her home. Suspicion becomes reality when she unleashes powers she’s not supposed to have. Powers that might well cost her the throne. 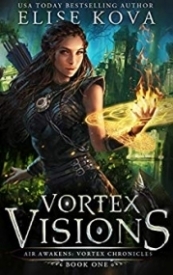 As Vi fights to get her magic under control, a mysterious stranger appears from across the world. He holds the keys to unlocking her full potential, but the knowledge has an unspeakable price — some truths, once seen, cannot be ignored. All eyes are on her and Vi must make the hardest choice of her life: Play by the rules and claim her throne. Or, break them and save the world. VORTEX VISIONS is a fantastic new book that starts a spin-off series from the Air Awakens books. While it is the beginning of a spin-off, it works as a stand-alone and things are explained in this book. There's also a different premise that makes it unique from the first series and whole in its own right. Here, we follow Vi, the crown princess who has lived her whole life in the North of Solaris. She desperately wants to be back with her family in the South, and while she had anticipated this move when she was 14, she is now 17 and has no idea when she may be reunited with them. Vi is also troubled about her magic. She can feel it but cannot access it, as she has not yet had her Awakening. Her lessons are becoming more difficult as she is unable to tap into her fire-related powers. On top of that, her friend and courier, Jayme, has arrived bringing news from her family and traveling with a young man (Andru) who is going to evaluate her for the Senate, who will be deciding whether she may rule, despite being next in line for the crown. She begins to realize the full spectrum of problems which may face her when she returns South, and the young man carrying the burden of her evaluation is the first sign of things to change. Soon, Vi realizes she is facing even bigger problems. The white death is spreading throughout Solaris, and her powers are growing quickly. She becomes caught in a much larger web of problems than just involve her country. Soon, Vi is challenging everything she knows and finds herself moving towards something more important than she could have imagined. With magic, friendship, mystery, and a little touch of romance (hopefully to grow in the future), this book moves with a fast pace, building a new story line and capturing the reader within its pages. Notably, the book has an open ending, so you will definitely be wishing for the next book asap! I really liked Vi and the other main characters, and I look forward to learning more about them and the larger world in future books. Vi really grows and matures throughout the course of the book- she begins as a somewhat immature (due to being so sheltered) 17 year old and grows into a stronger and more mature young woman throughout the story. It's a fascinating transformation to watch. Learning about her magic, which is also different and new (to us), is also really interesting. Add on to all that the mysteries about what is going on and how she plays into this destined future, and the book is easily a page-turner. I think it does help to have read the previous books to have some additional context, but things are explained in this book pretty well (particularly the elemental sorcery). I do wish there was more information about roles of guards (Jayme is not particularly attentive and separates from Vi at different points despite being her guard, maybe because Vi can mostly protect herself with magic?) and about the rulers/powers how these are intertwined/complimentary around Solaris. However, the book was still really fascinating and I enjoyed reading it a lot. I assume this will be expanded, along with the other elements introduced in this book, in the future. I highly recommend this book to lovers of YA fantasy- this new series is sure to be a hit!